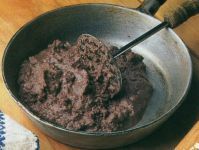 Refried Beans (frijoles refritos) are a traditional staple of Mexican cuisine consisting of mashed beans fried in a little oil. Heat the oil in a medium skillet, and saute the onion and garlic. Add the can of beans, and mash them with a spatula or potato masher while stirring. Cook, stirring often, until the bean liquid starts to evaporate. Reduce heat and simmer until the beans are like a light paste without liquid. Refried beans are delicious as a dip with corn chips or as a side dish with any Mexican meal. Spread them on fried corn tortillas topped with salsa and shredded cheese to make tostadas. Wrap them in a flour tortilla, add chopped onions and chili sauce to make burritos.